We have great effect on population due to our work field. In the mean time we have respect for innovative work conditions and our environment. For this reason it is important for us to be able add to the livelihood of our society. As a port of Skyteks’s corporate policy we support science, education, social needs and social projects by investing in them. 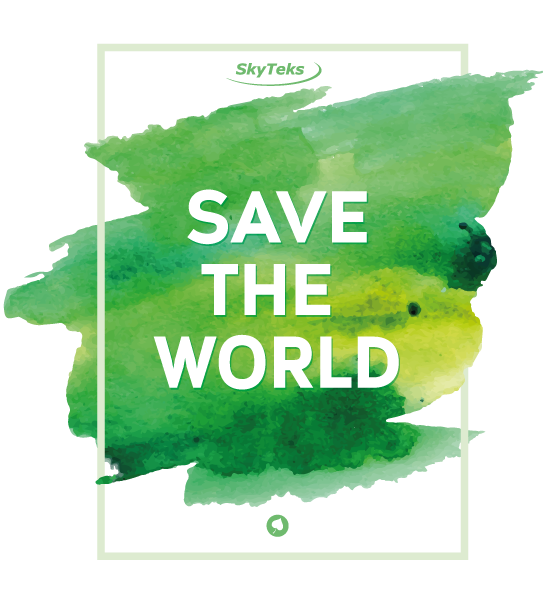 For Skyteks sustainability defines its survivability in the future and forms part of our major corporate policy. We can reach a permanent business success by creating a balance in between economic growth and ecological and social responsibility. Responsible work processes forms Skyteks sustainable harmonization principles. With the help of our policies in human resources, product management, health, environment and supplier management we can detect risks early and eliminate them. This is vital for the acceptance of our work by the society. Our corporate strategy matches our sustainability principles. Our target is to create an interventional value to sustain corporate success while protecting our social values. We are in the process of developing products that will provide social benefits and provide safety. This is the only way to ensure profitable growth and success. For this reason sustainability days an important role for our economic means. • Responsible work processes that reduce our work risks. • Our innovative power which creates new work opportunities and help us create ecological and social benefit. As Skyteks staff, we comply with the national and international environmental regulations so that we can produce environmentally friendly products. We value efficient use of energy and natural resources and make sure that our products can be used in full effect until the end of its economic life. We are sensitive to climate change and healthy environment so that we can pass it on to the future generations. We are trying to reduce our carbon footprint in all our activities and dispase of the waste generated by our activities in an environmentally friendly manner.